To the townsfolk of Wawa, the name Surluga is synonymous with the many abandoned gold mines dotting the rugged landscape. Surluga Road was a favourite washed out gravel roadbed for families to explore and go grouse hunting on an autumn afternoon. The original Surluga Mine head frame peaked above the tops of the trees on the southern hills bordering Wawa Lake. I remember on more than one occassion catching the site of a rainbow, created by a late afternoon rain, that seemed to pour right into the top of the Surluga Mine property. 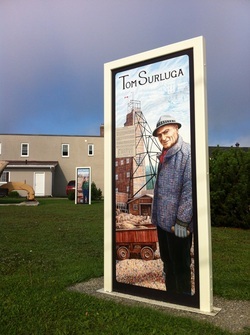 From his tiny home on the shore of Wawa Lake Tom could see the top of the mine shaft from his living room window. No doubt Tom himself saw some of those same rainbows.